Argh, this episode was just.....really boring. Kelly Osbourne might as well have just played herself in that swimmer storyline, outspoken rich girl whose parents travel a lot. As for the not-wedding...oh, what a surprise, Sam buggers up again! And then the rest of the staff have to run around for the rest of the episode trying to rectify his mistake while not getting caught! Because of the aforementioned dullness of this episode, the recap's down to my favourite moments. 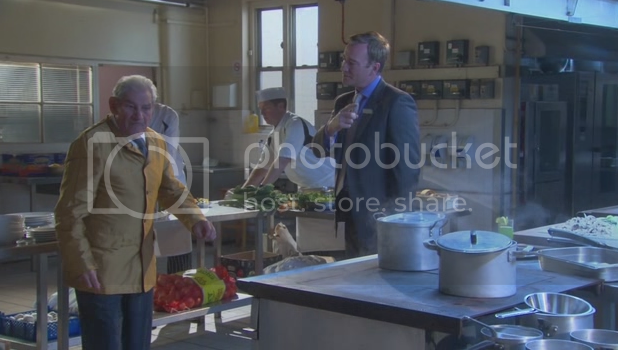 This week's Vicar of Dibley alumnus guest starring is Trevor Peacock, aka Jim Trott. He annoys James for most of the episode before James realises how good he is with the restaurant guests. So, the hotel's holding a wedding. Or was supposed to be holding a wedding, but then it got cancelled. So Sam and Juliet decide to stage the wedding anyway, and have everybody in on it, so they can recoup the costs. Ben and Emily are coerced into being the bride and groom. Ben and Emily play it up for the cameras as the princess and her fiance. Ben's quite comfortable with the cuddling part of the photo shoot, but then he has to kiss Emily. Which is awkward at first, but then he kind of gets into it. And that prompts Ben to rethink his preference for guys. Kind of weird, considering that in the premiere Emily tried to 'turn' Ben in the lift and couldn't even persuade him to kiss her. 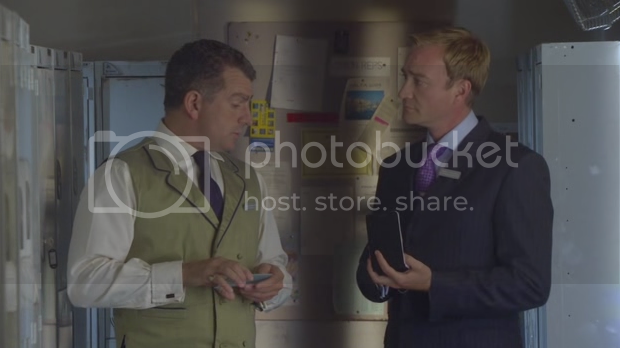 James (the best man at the not-wedding) stupidly asks Gino (father of the bride) for advice for his reception speech. Love the next episode, as it's all about how much they need each other. Tony takes time out from being annoyed by Kelly Osbourne to flatten his hair and play an Anglican priest who seems to have put his vestments on in the dark. It's for the not-wedding, obviously. Ben's crisis over his potential attraction to Emily thankfully ends as soon as he sees Tanya's hunky cousin. Also have watched Ashes to Ashes premiere. Cringed at certain moments (the messianic music when Gene appeared was obvious fanservice. And Manchester's Finest in a speedboat with machine guns, WHAT?! ), but overall still enjoyable. Very much worth it for the soundtrack, anyway. And Gene nicknaming Alex bollyknickers. In other UK cop shows, Law and Order: London premieres tonight too. Don't especially care for the original show, but Jamie Bamber on Australian television is always welcome and appreciated.